Victoria A. Melger, 81, formerly of E. Green Bay Ave., Saukville died Friday, November 10, 2006 at Heritage Rehabilitation and Nursing Center, Port Washington after a brief stay. She was born May 22, 1925 in Princeton, WI to Andrew and Mary Marshall Chikowski. On August 31, 1946 she married Harry J. Melger of the Town of Herman at St. Joseph’s Church in Princeton. He preceded her in death on June 4, 1972. While her husband was employed at the Kohler Company they resided in Sheboygan Falls and attended the current Blessed Trinity Parish. In 1958 they moved to Saukville where she worked at the former Northern Signal Company and cleaned for the Port Hotel in Port Washington. In 2003 she had moved to Lincoln Village in Port Washington and for the last year she resided at the Woodland View Estates in Fredonia. She will be remembered as a hard working, yet quiet lady. She was a member of the Catholic Order of Foresters. 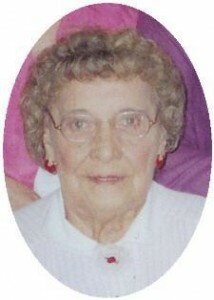 She is survived by her two daughters, Jean (Thomas) Bronson of Glendale and Darlene (Roman) Uhlig of Fredonia, 5 grandchildren, 10 great-grandchildren, two brothers Sigmund (Bernice) Chikowski of Sheboygan Falls and Donald Chikowski of Berlin, WI; nieces, nephews, other relatives and friends. She is preceded by her husband Harry and two brothers, Edmund and Raymond Chikowski.